Picking up where we left off last week, tonight’s episode "Trinity" shows everyone banding together, in some cases uneasily, to deal with the recently united Worldkillers. But the biggest struggles came as everyone attempted to navigate compromised trust and personal doubt. Lena’s brought in and questioned at the DEO by Supergirl, Alex and J'onn. Alex and Kara's trust in Lena has been compromised by the whole situation—Kara in particular when it's revealed that Kryptonite was used to keep Reign in check. Lena claims that she used the last pieces from one of the storage vaults she inherited from Lex. This is probably the biggest source of interpersonal drama in the episode as it makes Kara so uneasy that she asks James to break into L-Corp to check out the vault and verify the claim. Also, it feels a little odd that Kara would put James in this position, but she may have assumed finding out for sure would be a relief to him as well, especially considering his history with her brother. I could also understand why she wouldn’t just ask Lena to see the vault and send some D.E.O. agents to check it out. If Lena was lying already, what's to say she wouldn't show them the wrong vault? Still, James was obviously conflicted, and understandably so, but maybe they could've had a conversation about it instead of doing what he ended up doing. So, James, as Guardian with Winn providing support (from the Legion cruiser's bathroom that he didn't know was a bathroom), successfully breaks in, but decides not to enter the vault. His reluctance was obviously fueled by his feelings for Lena, particularly since Lena called James to tell him everything that happened after she was interrogated. She was telling him after the fact because she risked everything only to fail, and she did it over the phone so she wouldn't have to see him look at her "like a Luthor." I appreciated the vulnerability of this as one of her biggest fears is being seen as or turning into a super-villain like the rest of her family. Let’s face it, it's the shadow constantly hanging over her burgeoning relationship with James. Being completely honest, at least from an emotional perspective, is something Lena seems to use to ground herself and keep her from going dark (or too dark anyway). This whole situation is a pretty huge deal because James lies about the vault being all clear, and ends up telling Lena he's Guardian and that Supergirl asked him to break in the vault. So, I mean, yay for them being honest with each other and taking another big step in their relationship, but DUDE. I mean, I figure she likely already knows Kara is Supergirl just like she knew Alex was a D.E.O. agent (but didn't say anything since it was Alex's place to tell her), but if not, this feels like a step in the direction of Lena finding out. I mean, if everyone Kara has a close relationship with works for the D.E.O. or is a masked adventurer, Lena is sure to think something is up. But the biggest reveal comes after James' Full Honesty moment: Lena confesses that she didn't find the Kryptonite, she made it. I guess now we know why she was really afraid of going to the D.E.O. What's most fascinating about this is it cements Lena as being the apex brain in the family as, to my knowledge, no one has successfully synthetically created Green Kryptonite. Also, and maybe most importantly, this in conjunction with her data and knowledge of Reign could be the key to not only defeating her, but saving Sam. Again, I must acknowledge how great Odette Annable, Krys Marshall and Angela Zhou are in their parts. Highlights: Pestilence's self-satisfied description of killing her human side; Sam and Julia struggling to stay anchored in the Dark Valley; and Sam and Julia taking over their empowered bodies. Since Purity and Pestilence aren't going to be around anymore, I hope they get a shot at headlining something in the action/adventure realm. So, Reign is technically the only Worldkiller left, but the “essences” of Purity and Pestilence went into her. Does this mean the Reign is even stronger now? Does it mean that she has all three of their powers? Does it mean they can be reborn somehow? At least one of these are likely to be true. I guess we'll find out when Reign tries to kill Ruby. I brought up before that Ruby is half Kryptonian. If she has powers, this is likely when they will manifest. I do wonder if her DNA will somehow be helpful in saving Sam/Reign. I also wonder if her dad is just a regular old Earthling or maybe one of the aliens that have been hiding on Earth for decades? That's probably a step too far but it is an interesting possibility.. I appreciate Lena's respect for other people's secrets. She also did a great job of countering many of the accusatory questions lobbed at her with logic and empathy. There's something about the Dark Valley that reminds me of the Phantom Zone design from the Supergirl movie. Winn made Alex a suit and it's about time! We've yet to learn exactly what it does, but her new blaster is pretty darn cool. Where did Thomas Coville go? I'm assuming he didn't die when the Dark Fortress collapsed. And what, exactly, has he been doing this whole time? I still wonder if he's only helping as a way to elevate Supergirl into the savior status he imagines her to be. Pestilence is dead now, allegedly. So, what does the Legion do now? "Can we even get home," Mon-El asks Imra, who responds that Brainy will find a way. We don't know how time travel works in this this reality, so having changed something so big, how will the future change? And will Mon even go back? 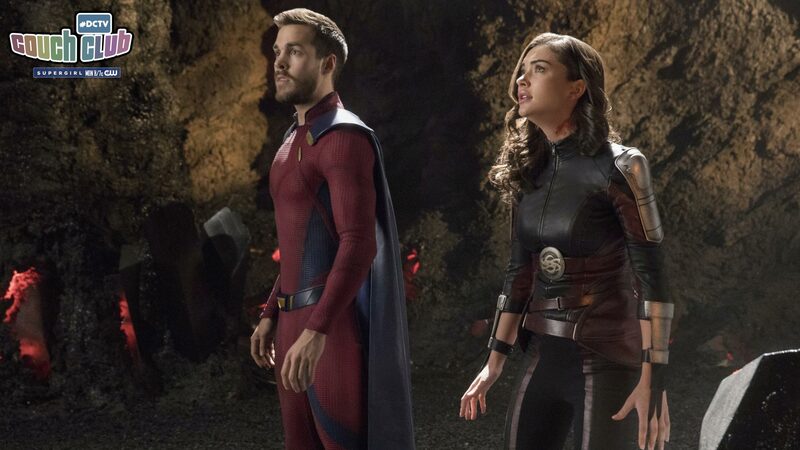 They're definitely building to some kind of...something there with he and Imra. In the comics, Imra is often married to fellow founding Legionnaire Garth Ranzz, aka Lighting Lad. It's possible he's going to be brought into the mix. I don't know how I'd feel if they have Mon and Imra break up and he and Kara get back together very soon after, though. A lot happened this episode! Were you surprised to see two of the Worldkillers dispatched so soon after they united? What do you think about the choices Kara, James and Lena made? Any predictions on what may happen to Ruby or anything else? Share your thoughts below!